Table Top Mountain (4,373') is visible when looking south from Phoenix. The summit is a flat 40-acre grassland. Around the mountain is a large collection of other flat-topped mesas with sloping narrow ridges, wide canyons, sandy washes and lava flows. The area has lots of cacti, mesquite, ironwood, creosote and paloverde. 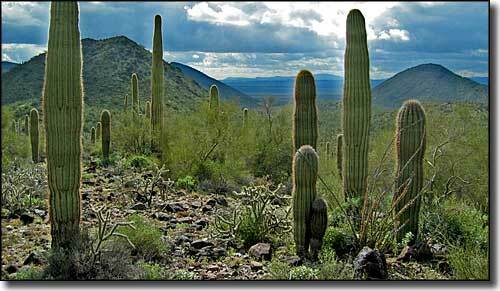 The southwestern slopes here grow a dense forest of saguaros. You'll find javelina, coyotes, desert tortoises, and desert bighorn sheep hiking around. You'll also find the Ajo Mountain whipsnake and the giant spotted whiptail lizard out here. The 34,400-acre Table Top Wilderness sees little human use, and most of that is only along the 4-mile Table Top Trail, a strenuous route that leads to the top of Table Top Mountain and delivers some great panoramic views. There is another 7-mile Lava Flow Trail that meanders through the lowlands of the wilderness. 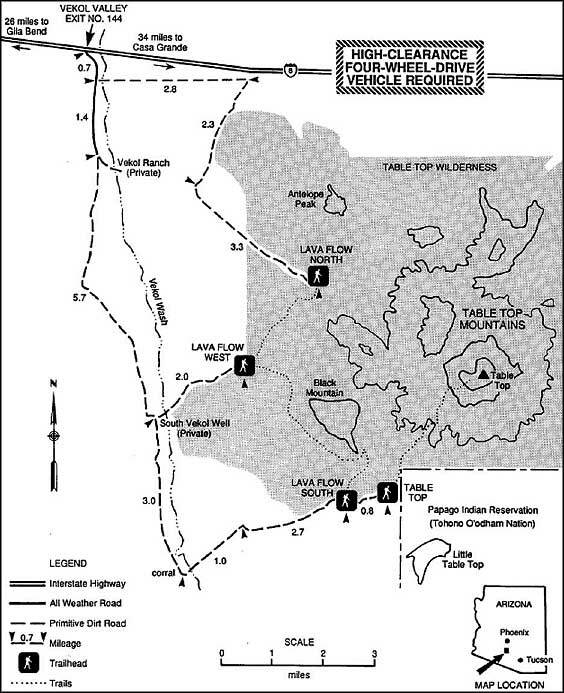 A strong hiker can round-trip the Table Top Trail in about 5 hours, the Lava Flow Trail in about 6 hours. The best time to visit: October to April. Most folks access Table Top Wilderness by getting off the I-8 at exit 144 and heading south on the poorly maintained Vekol Road. It's reputed there are signs along the way, but you have to be looking hard for them (and most of them just say "Trail"). 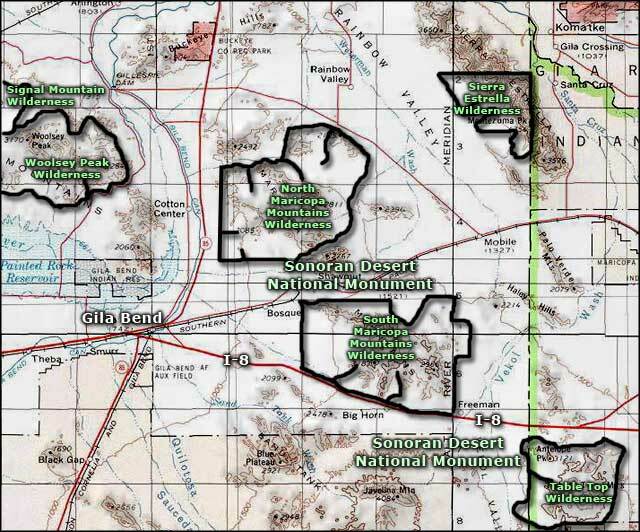 Upper photo and upper map of Table Top Mountain courtesy of the Bureau of Land Management. Lower photo of Table Top Trail courtesy of the Conservation Lands Foundation.